The final days of Superman are here! Batman and Superman are working to prepare the world for the loss of the Last Son of Krypton, but nothing can prepare the planet for what's to come. The superheroes will find friends and foes as they traverse the Earth in a desperate last attempt to save the Man of Steel! 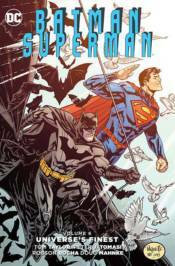 Collects BATMAN/SUPERMAN #28-32, plus never-before-published stories originally slated to appear in BATMAN/SUPERMAN #33-34 and ANNUAL #3!